You are here: Home / News / Can I Climb Gannett? On a guided climb of Gannett Peak with Montana Alpine Guides it comes down to physical fitness as we handle all the rest. However, if you are on your own, there is quite a bit more to consider. Gannett Peak (13,809’) is essentially a backpacking trip with a technical snow climb at altitude in the middle, followed by a backpacking trip out. In route to the summit you will travel through bear country, cross challenging rivers, boulder fields, complex route finding, pre-dawn starts, and technical snow climbing, among other challenges. Physically you should be comfortable hiking for two full days with a 40–50 lb pack to your high camp. Summit day on Gannett requires waking up pre-dawn and navigating by headlight to start out your eight to twelve hour summit attempt with elevation gains between 2,000’– 3,000’ and equal losses. Ultimately you need to save some in the tank to then hike out the same route on your final two days. Fortunately you can train any where, even in Florida, so with enough forethought anyone can get into shape. Then again, with enough prior fitness and motivation a week will do. The mandatory technical skills are a bit harder to acquire, you don’t just gain mountain sense through a book and it’s hard to learn how to travel safely on snow with ropes, crampons, and ice axes without having been on snow. You need these skills on Gannett Peak. You need to know how to read the weather, deal with thunderstorms and lightning, how to time your ascent, when to turn around, etc. 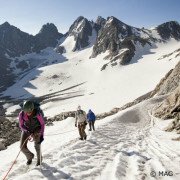 If you choose to go on your own you should feel comfortable traveling as a rope team on snow and know how to manage safety while climbing in your group. The snow can range from knee deep slush to icy hardpack, the former can take far more energy, the latter greatly increases the severity of risk. Plan and know how to use ropes, ice tools, crampons, rock gear and snow pickets as you see fit to maintain safety. 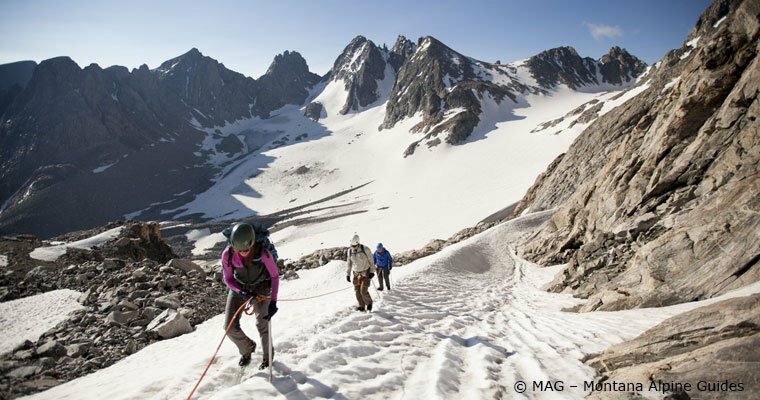 On a trip with Montana Alpine Guides (MAG) we handle all logistics and technical components so that you don’t have to. Whether you join MAG or not you will need to consider what we would cover including: individual and group technical gear selection, cooking set up and food selection for meals, logistics (transport, permits, porters, etc), responsible camping and food storage in bear country, high camp locations, route finding where no trails are present in open meadows, boulders, and snow fields; and of course all technical ropework travel to safely ascend (and descend) Wyoming’s highest point. For more photos and detailed information on MAG’s guided climb on Gannett Peak, visit our Gannett Peak page. https://www.mtalpine.com/wordpress/wp-content/uploads/2015/01/5.jpg 400 760 Radka Dumbrovska http://www.mtalpine.com/wordpress/wp-content/uploads/2015/04/WEB_LOGO3.png Radka Dumbrovska2019-03-29 19:28:372019-03-29 19:31:28Can I Climb Gannett?